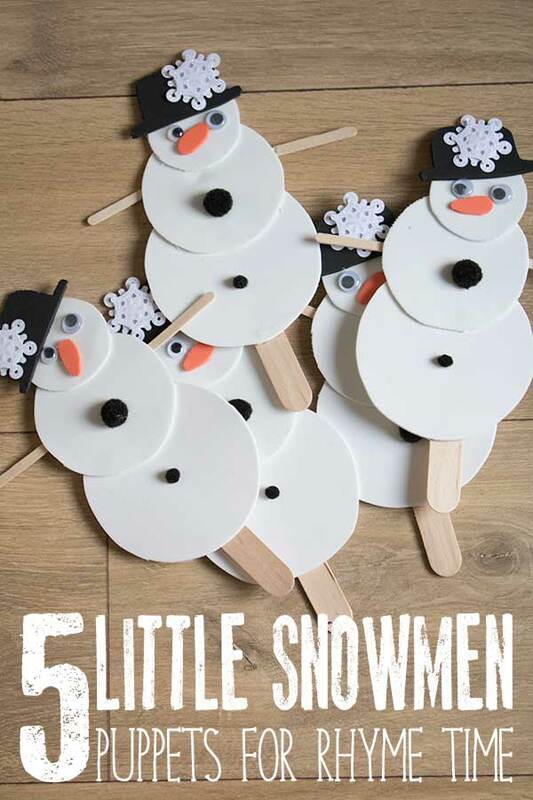 Two of our featured Winter Nursery Rhymes include 5 Little Snowmen so what do you need when your singing the rhymes some puppets of course and these puppets took me no more than 30 minutes to make and then can be used with your child or children to act out the Nursery Rhymes as well as to be used for playing in a puppet theatre. 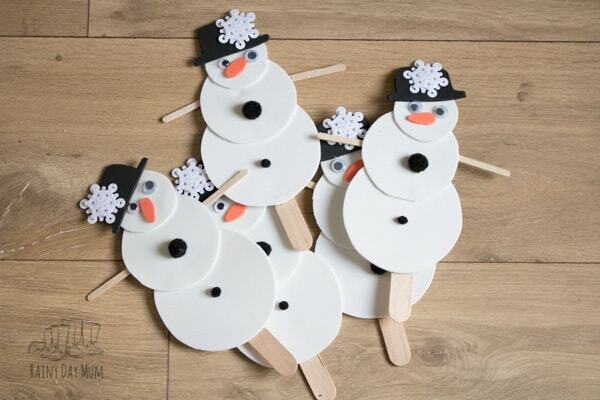 So here they are the 5 Little Snowmen Finger Puppets to make and play with. 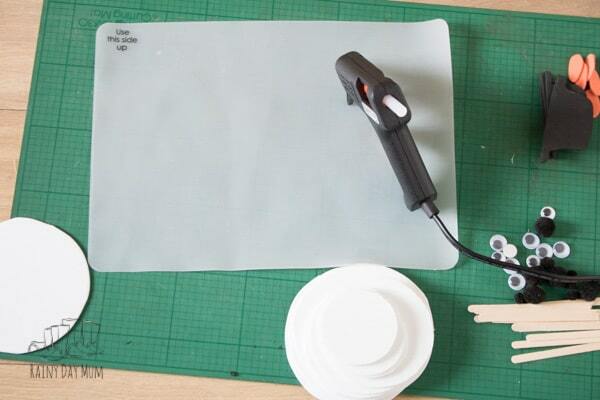 We have used a hot glue gun for this because it was quick and would produce a strong bond – you could use strong double sided sticky tape, white glue or any strong glue to produce the same effect but take into account drying times. 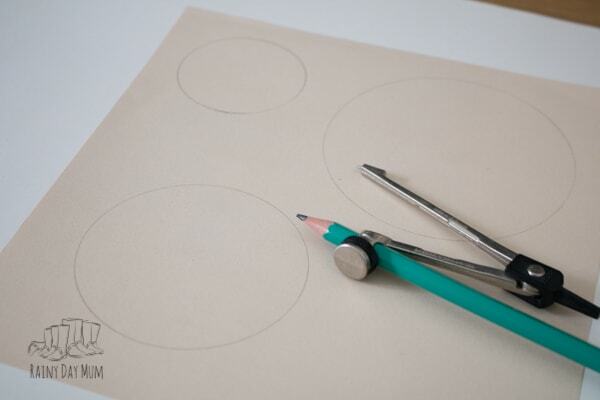 First, draw 3 different sized circles on your scrap paper or cardstock to be your snowman body templates. 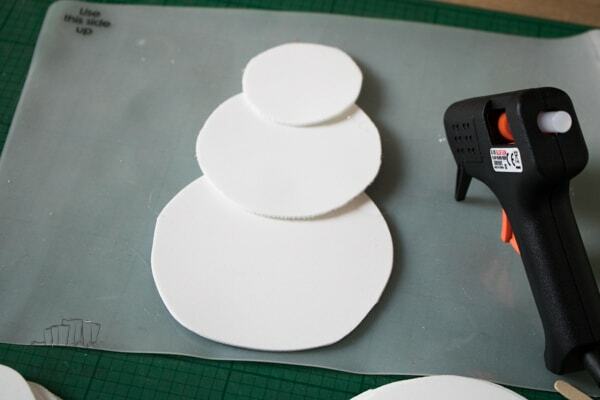 Use the templates to draw around on the white craft foam 5 times for each body part. 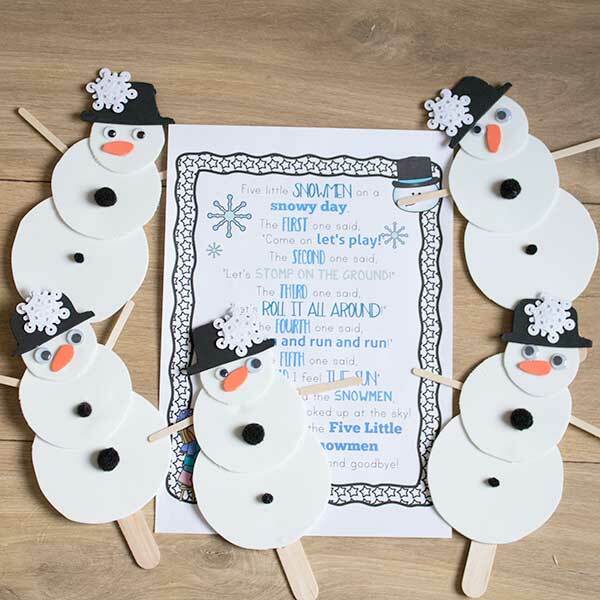 Cut these out and set aside whilst you create your snowmen accessories. 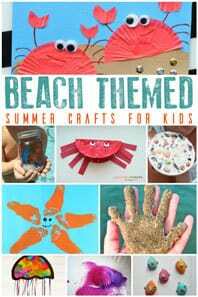 With one of your body part circles cut out a hat shape. 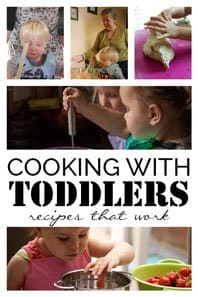 We made ours a top hat. 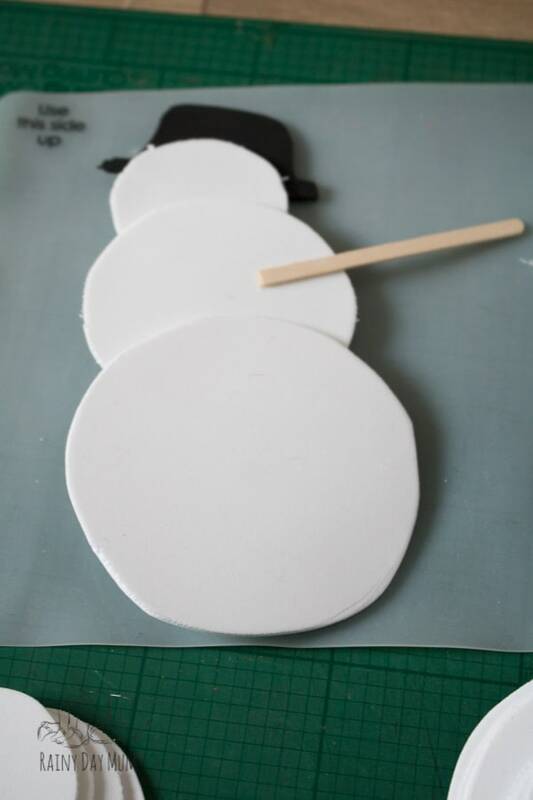 Use this as a template on the black craft foam and cut out 5 hats for your snowmen to wear. 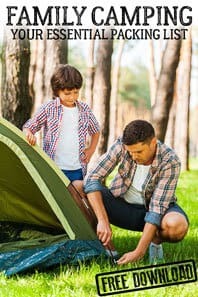 With the top hate template inside draw the shape of a carrot nose and then cut out. 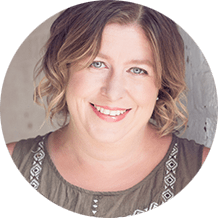 Use this carrot to create 5 carrots out of the orange craft foam. 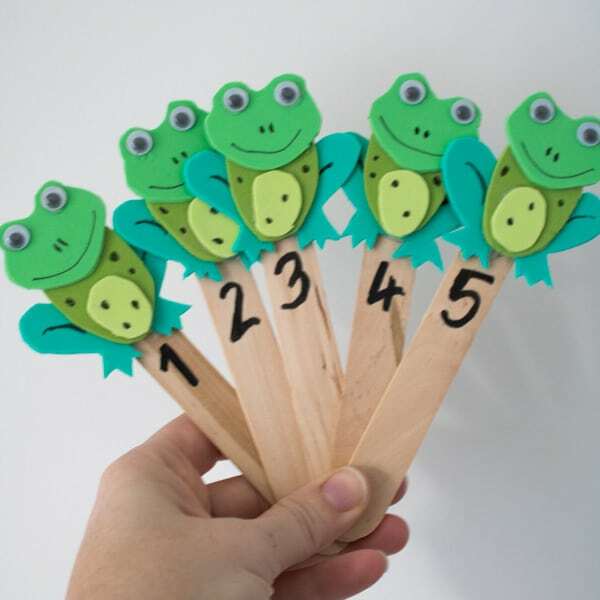 Cut 5 coffee stirrers in half – these will be the snowman’s stick arms. 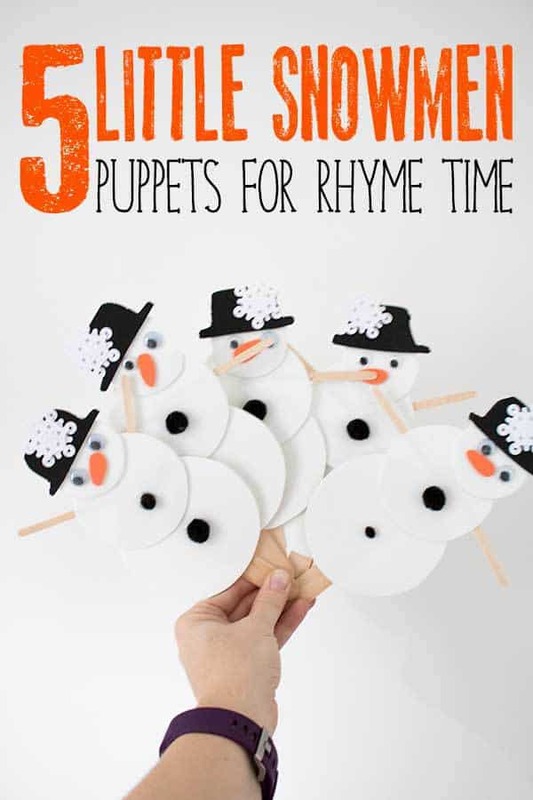 Discover more Winter themed Activities and Crafts for Toddlers and Preschoolers which would be perfect to use after playing and singing with these puppets. 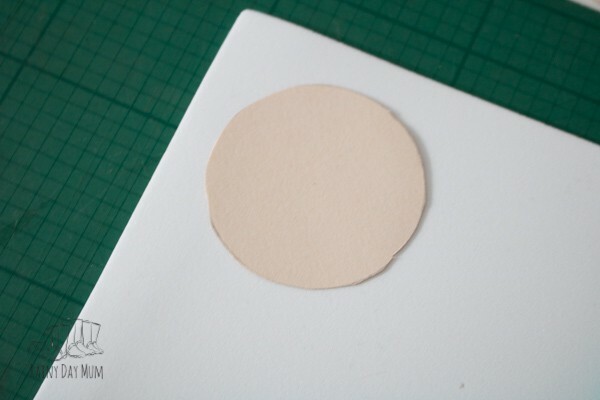 Start with the largest of your circles and add some hot glue at the top of the body. 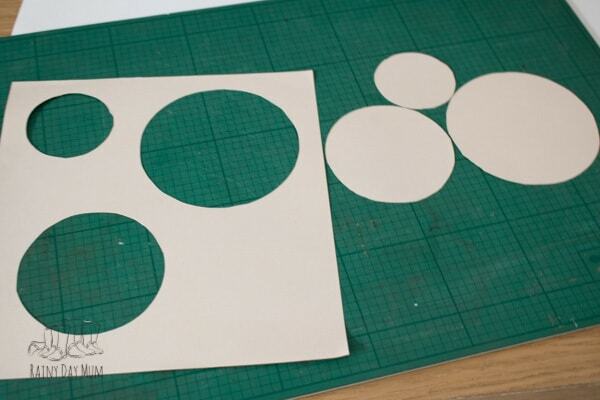 Attach the medium sized circle to this. 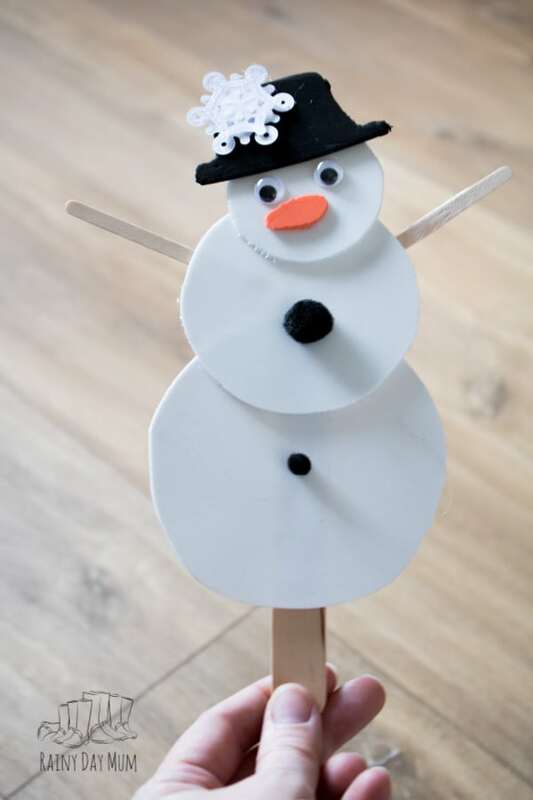 On the smallest circle (the head) place some hot glue on the bottom and add to the medium circle so you have a snowman with 3 body parts. 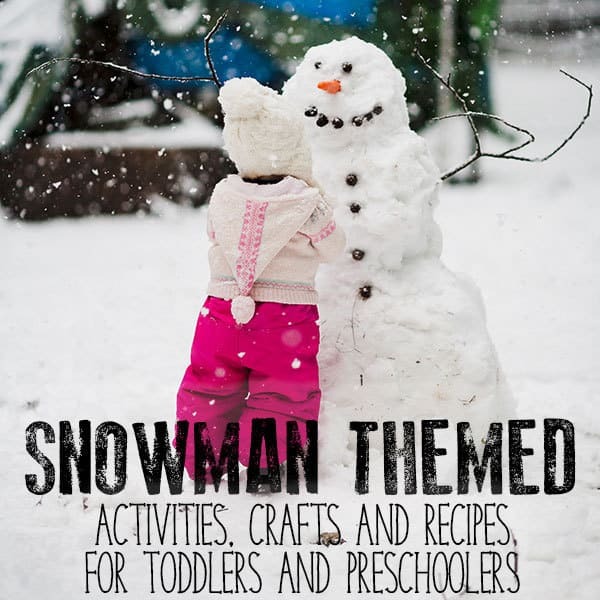 Along the bottom edge of your hat add a little hot glue and place the hat on the snowman. 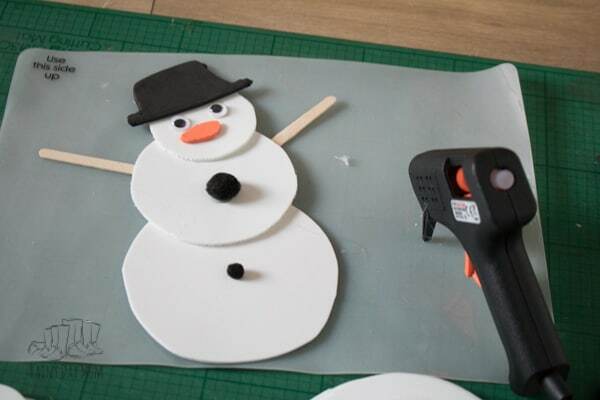 Now add a dot of hot glue to the snowman’s nose and place on his face. 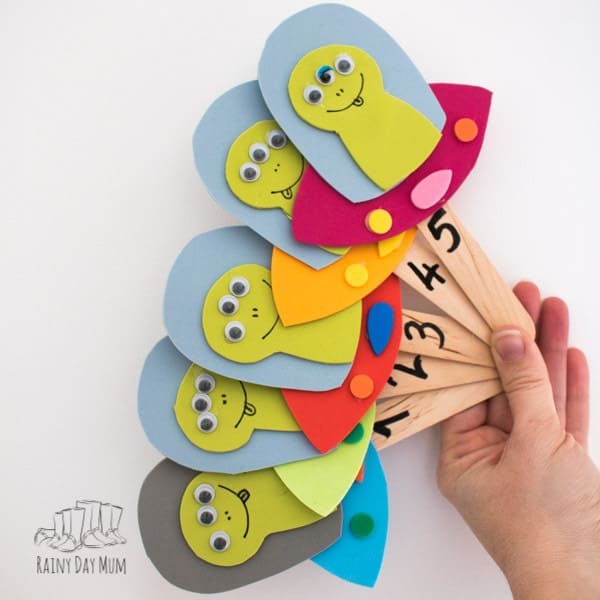 On the back of each wiggly eye add a dab of hot glue and attach. 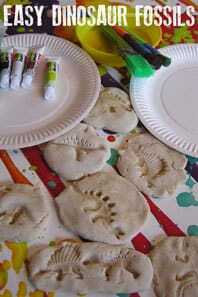 Do the same with the pom poms to add buttons to his middle and bottom sections. Position and hot glue in place the coffee stirrers to be arms. 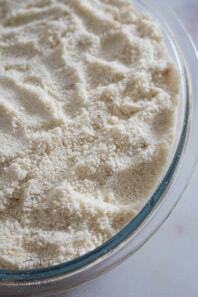 Then take your large craft stick and hot glue along it about 2/3rds and attach. 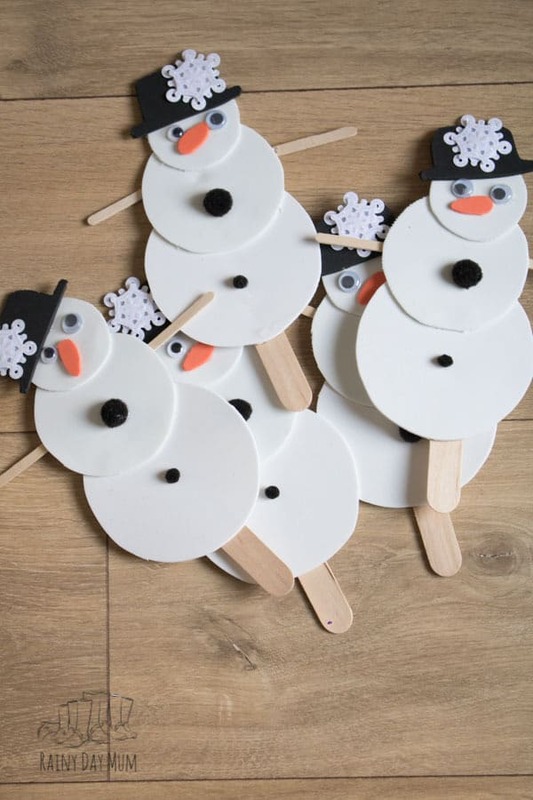 Turn over and let all the glue call down as you make the other 4 little snowmen puppets. 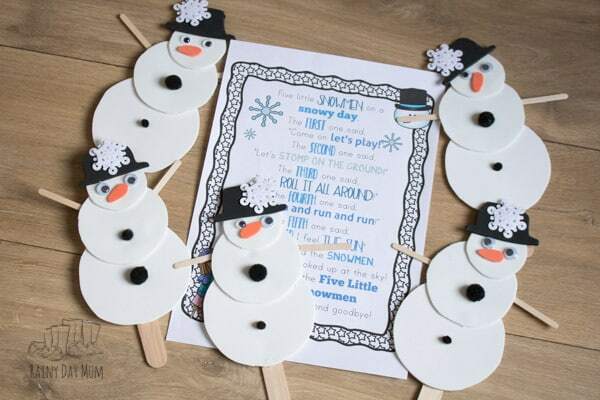 Find the words to our 2 versions of Five Little Snowmen – you can see the words here on our Winter Nursery Rhymes and Songs post or you can purchase our song pack which includes these words as well as the words to all of the other featured Winter Songs. 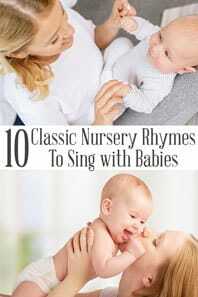 With the words use the puppets to sing along with the songs you can hide the puppets as they melt away. 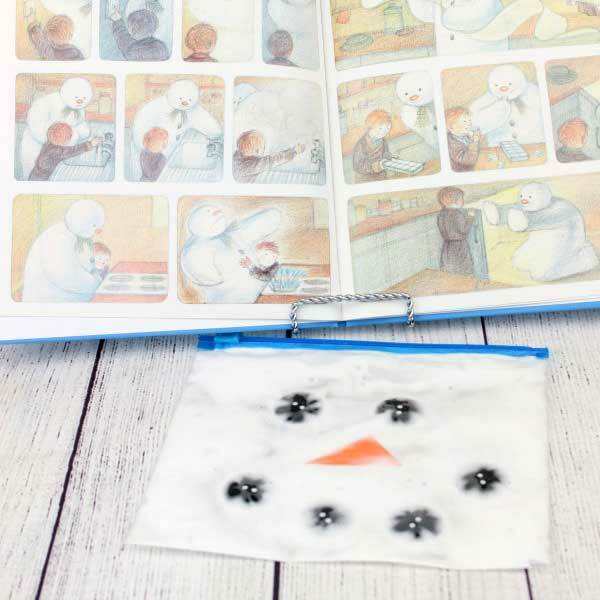 Create a Melted Snowman Sensory Bag and Read The Snowman at the same time. 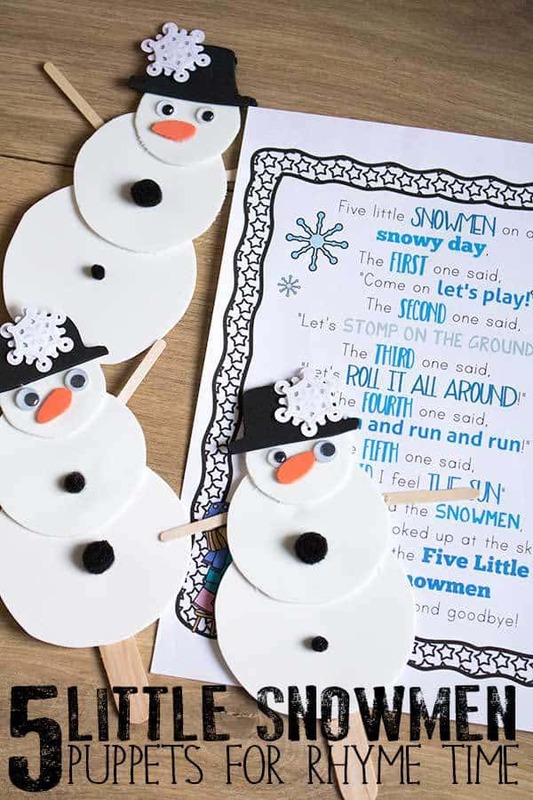 Count and Learn Letters with Snowmen – included is the free printable snowman sheet to save you a little time.